If you are still looking for the perfect Valentine’s Day gift, we have you covered! 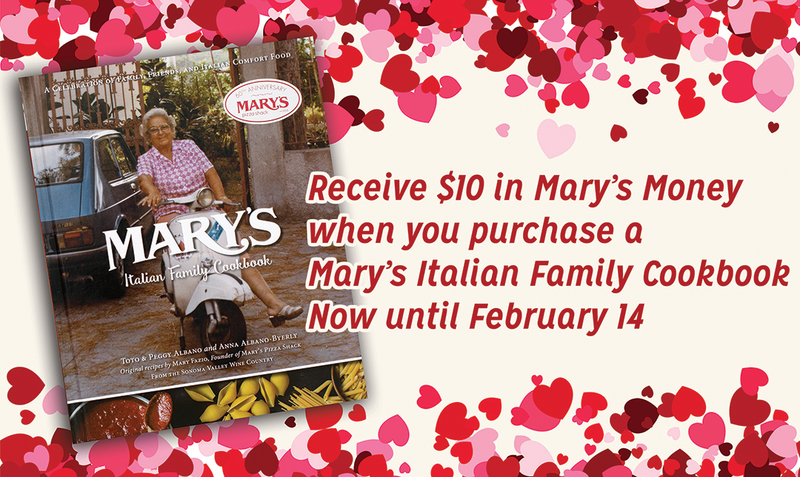 From now until February 14, receive a $10 Mary’s Money with every purchase of the Mary’s Italian Family Cookbook. A gift for you AND your boo! You can order the Cookbook in-store or online. For online purchases, the $10 Mary’s Money will be mailed to you separately. Thank you Mary’s for putting God and family first. Same thing happened to me! Pretty pissed. You probably should have turned off the online ordering then... I got this “confirmation” and my card was charged. Drove to pick up my order to find the restaurant was closed. Irritated to say the least.